We have a love-hate relationship with email. Research shows employees spend an estimated 71 hours on irrelevant emails per work year – that’s almost 90 minutes a week. Yet, CEOs, leaders and employees agreed email is an effective way to exchange information at work. So, in the spirit of using email better, and helping others use it better too, we’ve created the 10 Dos and Don’ts of Email with suggestions anyone can implement to avoid email abuses and fix bad habits. Armed with these 10 practical tips, you’ll be able to spend more time focusing on other important aspects of your job and less time getting bogged down in unnecessary emails. 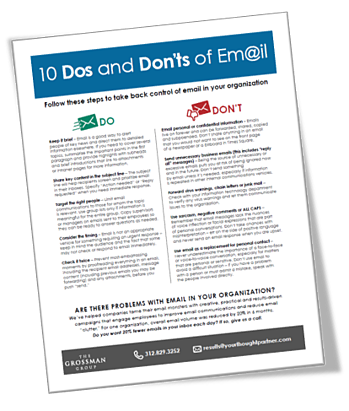 Download—10 Dos and Don’ts of Email Tip Sheet— by filling out the form to the right, and get the steps you need to take back control of email in your organization.